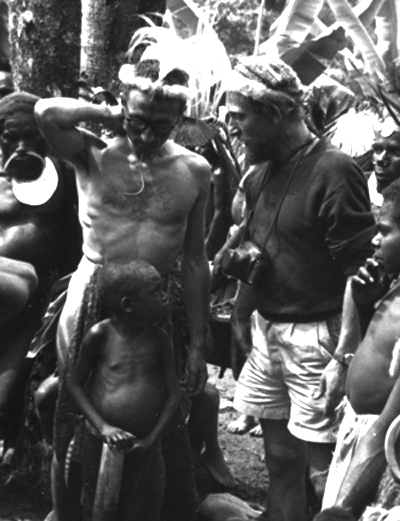 The second day of the celebration dawned clear and Mbera set off early from Gunts to join the young Fungai men who were dressing in Nomani’s yard in Tenegump. 110-02: Mbera sets from Gunts, crossing the fence behind the mens' house. 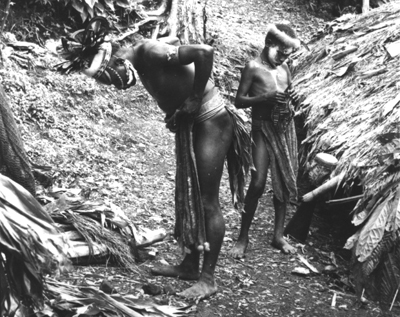 A number of men had gathered outside Nomani’s yard and were preparing their finery. 112-00: Nomani tucks a fine, fur-decorated minja into his belt. 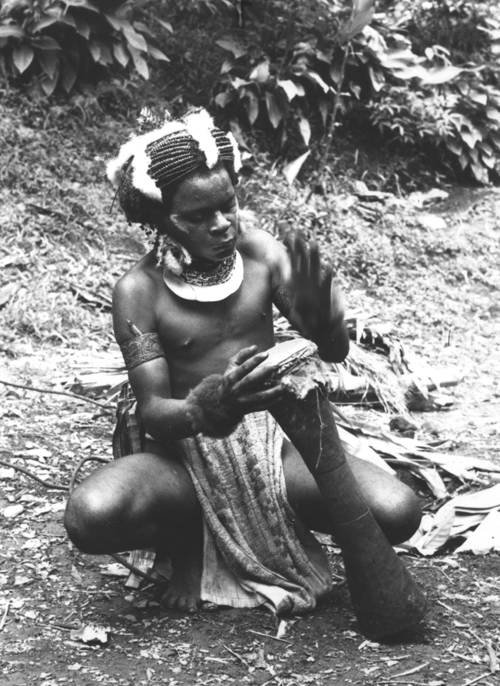 112-00: Mbera pleats rumbim leaves to tuck in the back of his belt. 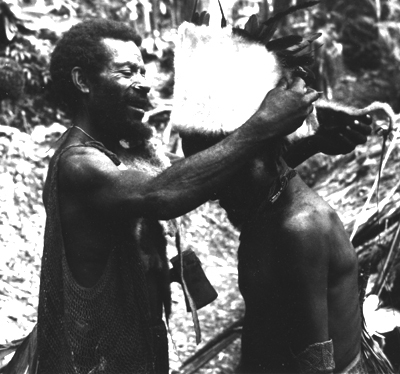 112-11: Mbera's father, Numbi, helps a friend put on a fine possum fur headpiece. 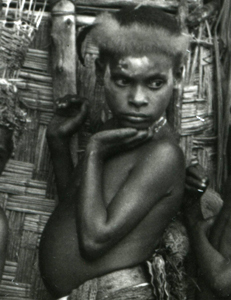 Mbera’s older brother, Gonda, was wearing a green beetle and fur headdress. Instead of a netted minja, he wore a colorful towel to celebrate the occasion. 112-27: Gonda completes his preparations. 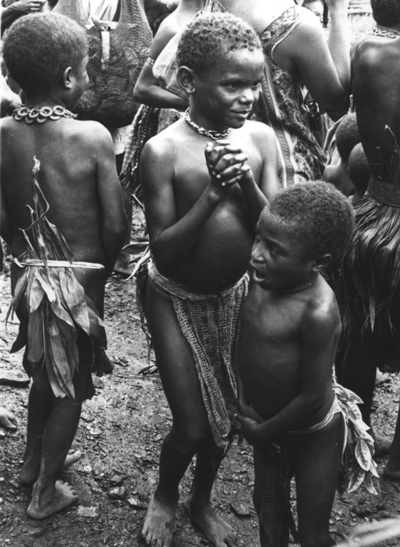 By the time the local men were dressed, men and women from the Korama clan across the Rigahn River had arrived. 116-31: Women greet each other in Gunts Yard. 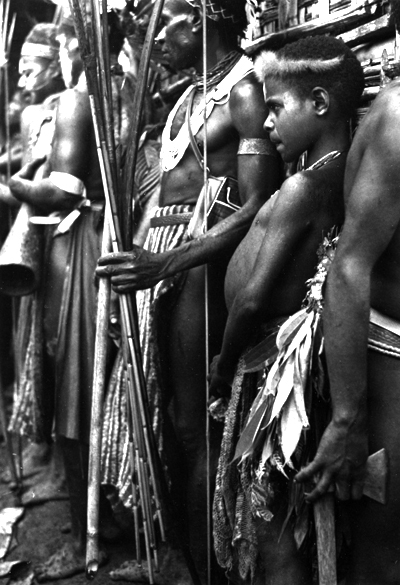 The Fungai and Korama men formed one dance contingent that swept into Gunts Yard, led by Luluai Pfun and Aikapo’s brother. 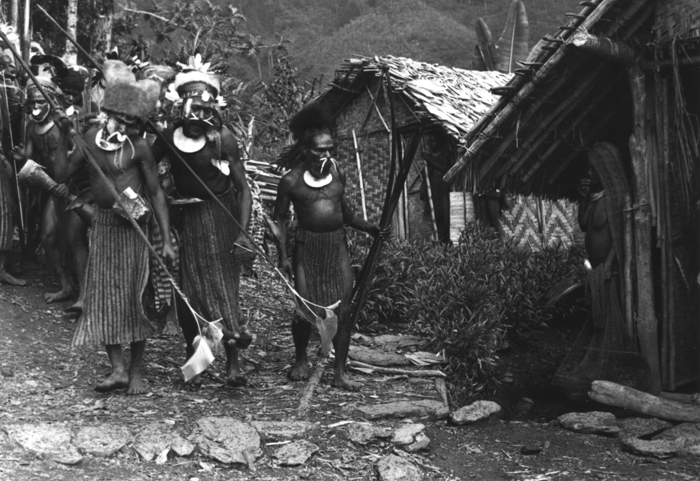 On the tips of their spears they have tied enchanted taro leaves to cleanse the ground of hostile spirits. 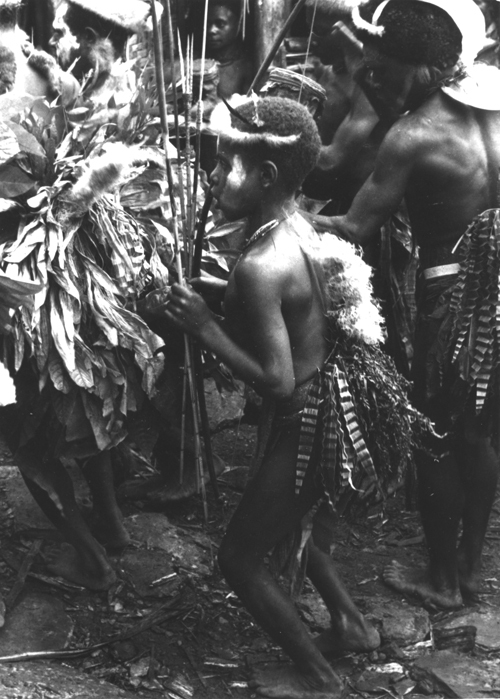 114-19: Pfun and Aikapo’s brother lead the Fungai-Korama dance contingent. 115-09: Pinai and Mapi react to the dancers circling the yard. After several rounds of Gunts Yard, the dancers broke off so the pork that had been cooked the day before could be distributed to the guests. 116-22: Portions of pork are displayed on banana leaves before being distributed. 117-14: Peter Vayda and Marek, watched intently by Maia, consider the distribution. 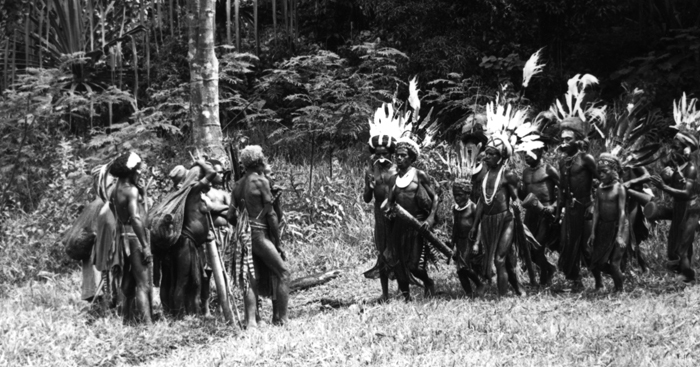 Later in the afternoon, dance contingents arrived from more distant clans. 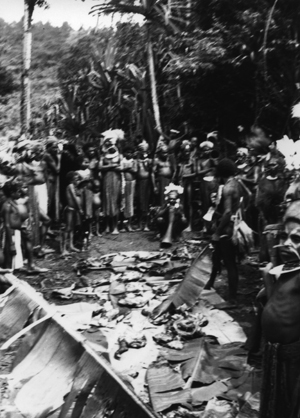 First they gathered on the old singsing ground in Koinambe, within earshot of Gunts. 117-29: Visiting dance contingents arrive at the old dance ground Koinambe within easy earshot of Gunts. 122-15: A dance contingent wields axes as it enters Gunts Yard. Mothers, sisters and wives watched from the side-lines. 122-16: Rika, Kant’, Mbi, and little girls from Fogaikump stand at the back fence to watch the dancers. 122-21: Minme puts pleated rumbim leaves into Worenai’s belt. He would later marry her daughter, Kum. 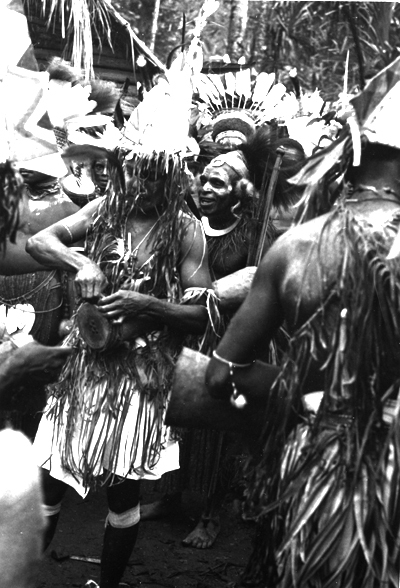 By this time, everyone was waiting in anticipation for the appearance of the dance contingent from the Anglican Mission Outpost in Gai. 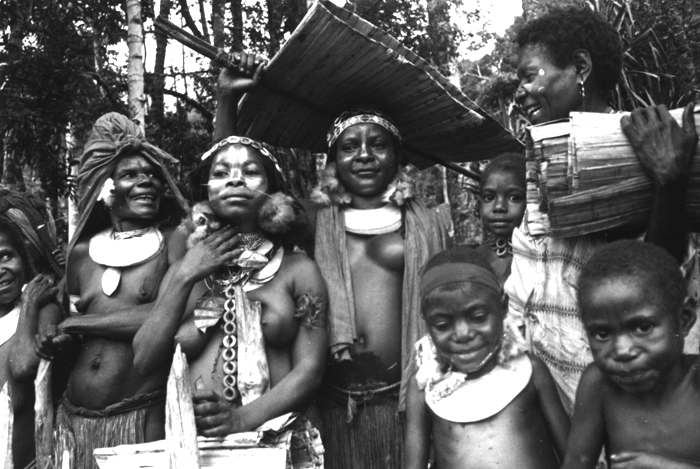 As they were Christian and came from distant parts of Papua, we all wondered how they would present themselves. As the afternoon wore on, the weather clouded in and rain fell. 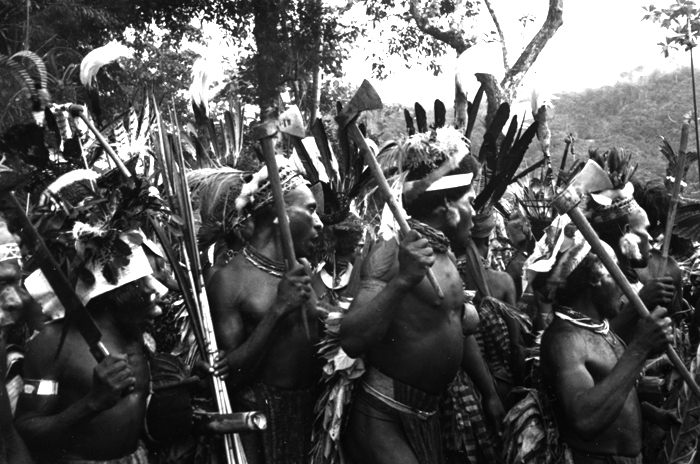 Wet weather was always a worry during a singsing, as rain would spoil the plumage in the men’s headdresses. 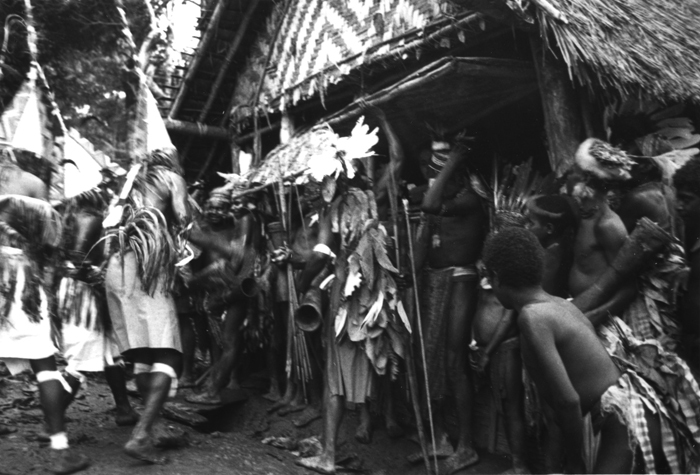 125-38: Mbera shelters from the rain with other dancers crowded under the eaves of the Vaydas' roof. At last the Mission brothers arrived. 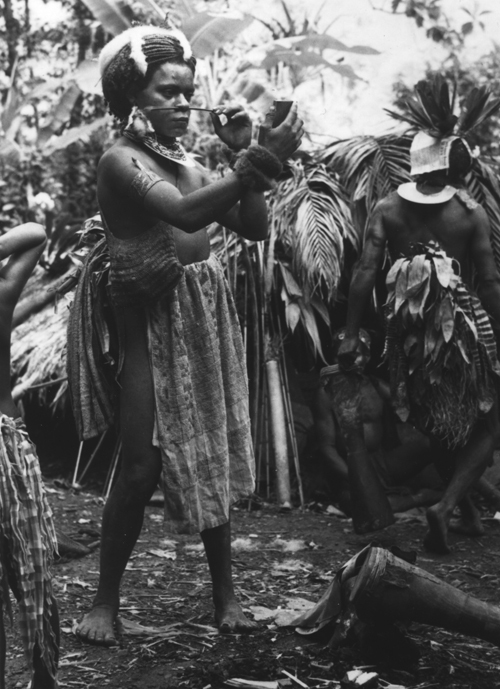 Herbert Bapera, the evangelist in charge in Gai, had come with them, though he did not dance. 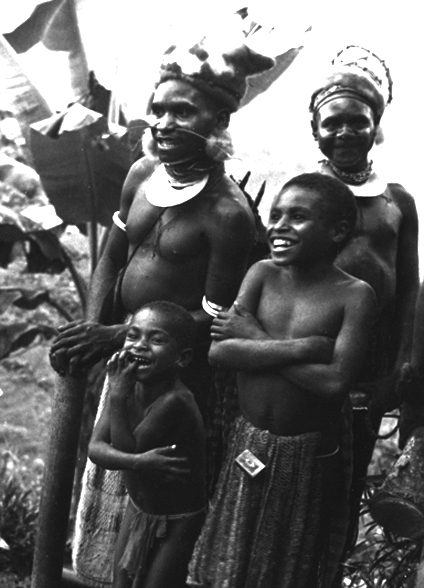 Local people appreciated the way they had decorated themselves using paper and bits of cloth. 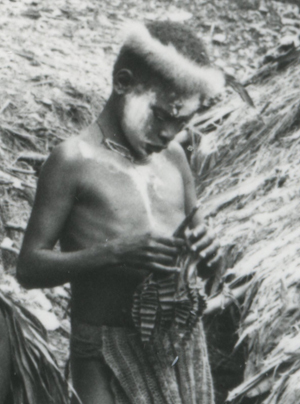 They had even used white bandage material from their first aid supplies. 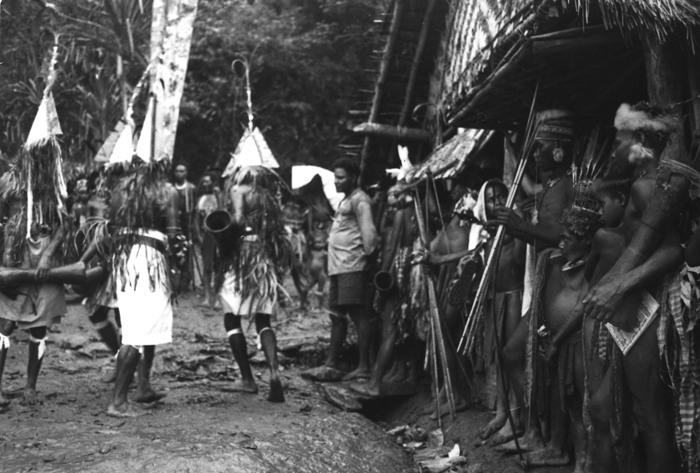 126-23: Herbert Bapera stands at the entrance to the Vaydas' house as the mission brothers in white headdresses and laplaps circle the muddy ground. 125-33: A mission brother fixes his drum. 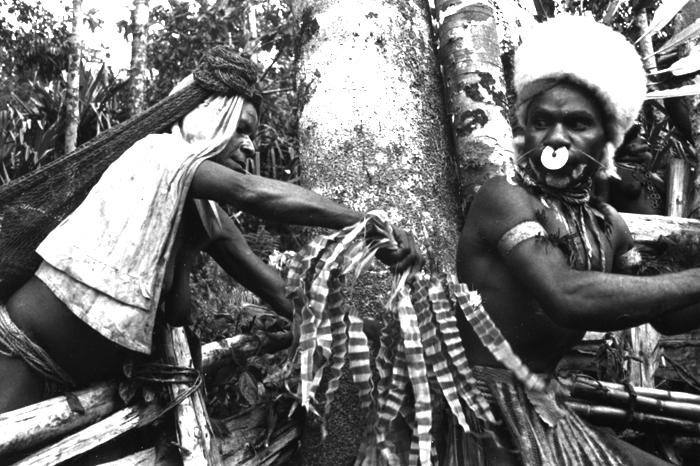 127-08: Aut'a and Maia especially enjoy the Papuan dance style. 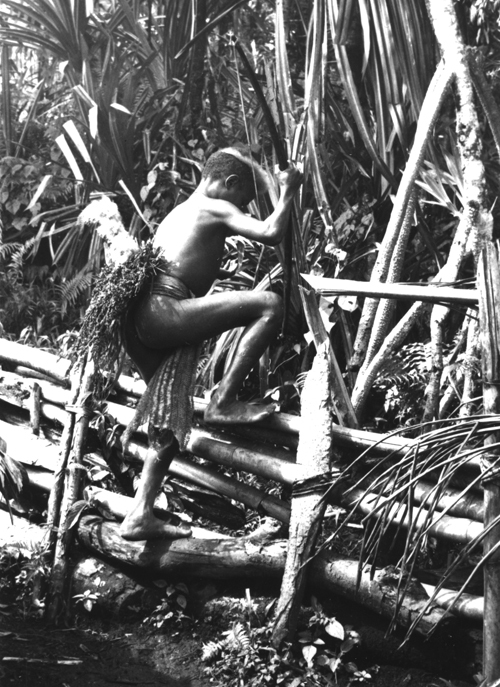 126-19: The Papuan brothers wheel past the Vaydas' house again. But the rain kept falling and dusk came on early. Gradually the day of celebration came to an end. 128-28: Mbera at the end of the long day.